← Monumental Steel Supported Stained Glass Arch. 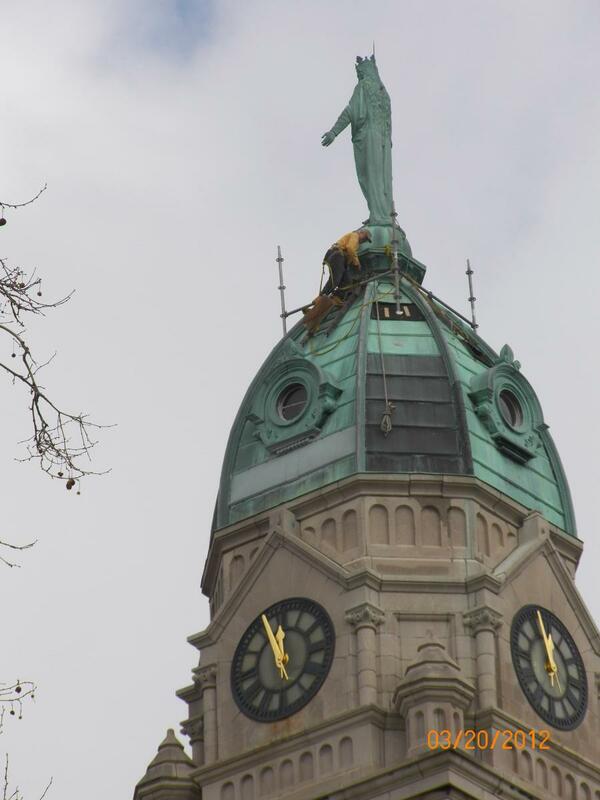 Rigger begins to assemble scaffolding at the base of the statue, 150 feet in the air. 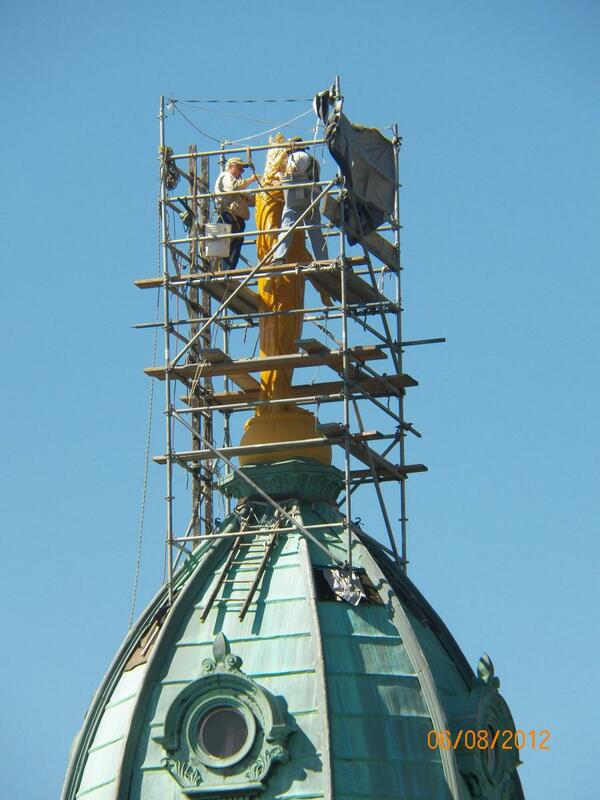 Jack Hassler Company of Philadelphia, PA gilded the monumental hand formed sheet copper statue on the tower of the Shrine of the Miraculous Medal, using 24.75 carat gold leaf. “24 carats” means that it is 24 parts out of 24 of pure gold, the most stable metal known to man. Why gold? Because it is gold, number one, and a suitable raiment for the Queen of Heaven, and number two, because gold does not oxidize, it only wears away mechanically, by erosion. At 150 feet in the air, access was a significant issue for the project, but not for Jack Hassler, fully qualified riggers and steeplejacks. The statue is over 12 feet tall, and very detailed. The actual gilding took over a week, but there was considerable prep, incidental metal repairs, hand sanding of all surfaces and three coats of primer. They also gilded the hands on the face of the clock. Gilders at work, note scale of the statue. She had never been gilded before, note bare (verdigris) metal. 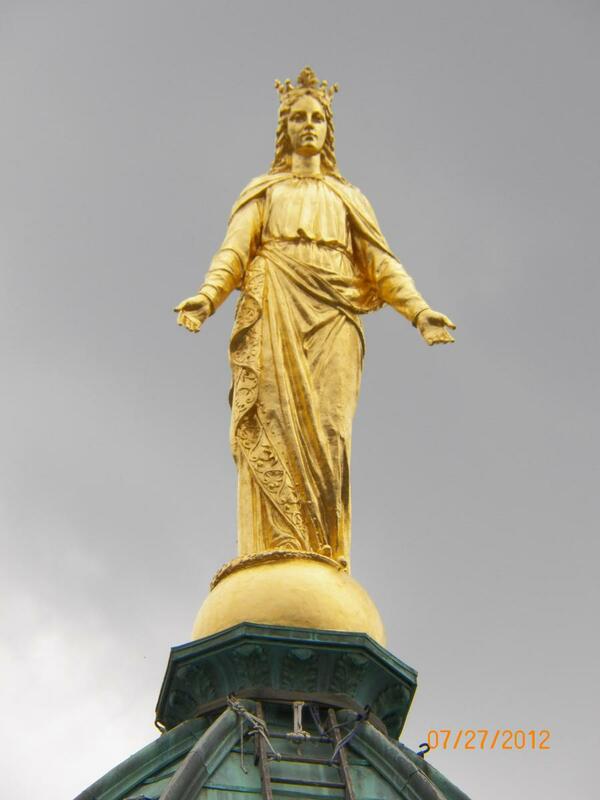 Queen of Heaven statue, gilded. This entry was posted in Steeples and Towers and tagged Pennsylvania, Statuary. Bookmark the permalink.